Passport or ID card? Citizens of the European Union can travel to France on a national identity card, if they have one. EU citizens who do not have an ID card, and citizens of other countries, must be in possession of a valid passport. Visitors from non-EU countries may need a visa, depending on the length of stay and their country of origin. Visas are not required for citizens holding residence status in any other "Schengen" country, whatever their nationality. For the purposes of a short trip (less than 90 days), visas are not required for visitors from the United States, Argentina, Australia, Brazil, Chile, Japan, Mexico, New Zealand, Venezuela and several other countries. For a full list of visa requirements for short or longer stays, visit the official French visa info website in English. Travelling to France by car: (Click here for ► Driving in France). Travellers coming from the UK: it is usually sufficient to just turn up at a ferry port or the channel Tunnel, and buy a ticket for the next crossing. However, this is not advisable in the peak holiday season, or at busy weekends. Besides, it is often possible to shop around and get a cheaper price, if you book in advance. Click here to compare ferry price offers and book online. Driving to France from most other neighbouring countries (Belgium, Luxembourg, Germany, Italy, Spain) is no problem at all, as systematic customs and border controls have been abolished within the Schengen area, and traffic flows smoothly across these borders. Customs and passport controls may slow down traffic across borders from Switzerland, though this is not usually the case. The border crossing from Andorra can be very slow, if customs decide to check cars for contraband, notably duty-free cigarettes, as they often do. From the UK and Europe. 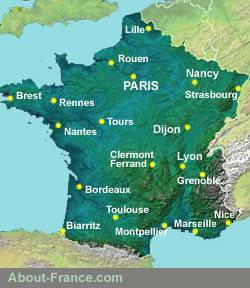 There are a large number of regional airports in France, with flights from the UK and other countries. For further information, check out the flights to France page. Flights from North America. For transatlantic passengers, or passengers from other continents, the general point of arrival in France will be Paris Charles de Gaulle (CDG) airport. Nice airport is served by Delta from JFK. Geneva airport, which has flights from the US and Asia, lies on the French-Swiss border, and has a direct exit to France. Brussels, Zurich and Luxembourg airports are also within easy striking distance of France. Check out options and best value flights on Expedia. For flights to France from Australia, Asia-Pacific area and all other long-haul flights to France, consult Expedia for best options and prices. Currency : France uses the Euro. The easiest way to get holiday money (and often the cheapest) is to withdraw euros from an ATM (hole in the wall, cash dispenser) on arrival in France, or even from a Euro dispenser in the departure area at a major UK airport. Most French ATMs accept foreign cards (Visa, Mastercard, Maestro, etc). (See page on Banks and paying for things in France). Note: If your bank / credit card account is not in Euros, you will pay a commission on each transaction – withdrawal or payment. Commissions are proportionally greater the smaller the transaction, so it is not advisable to use your card regularly for a lot of small transactions. You will pay less (maybe quite a bit less) by withdrawing enough cash for a day or two from an ATM, then paying in cash. Health : visitors are strongly advised to make sure that they have health insurance cover before travelling to France or any other foreign country. For France, UK visitors should obtain the European Health Insurance Card (EHIC), which has replaced the old E 111 form; further details on the About-France.com health cover in France page. There are hundreds of internet sites offering direct booking for hotels, but beware of sites supposedly offering the "cheapest deals". Check out a few sites before you book. Visit the hotels page for information on French hotels, else our information on Paris hotels, or the interactive holiday rentals maps on Gitelink.com for information on renting a cottage, or bed and breakfast. Paying in advance; gites, small hotels, campsites. If you need to make a deposit for accommodation, some premises will accept credit cards or Paypal; but for those that do not, it is usually possible to make an "IBAN" transfer, which is quite simple and not expensive. Ask your bank for details. Mobile phones / cellphones: if you want to continue using your national mobile phone while abroad, you may need to enable international use by contacting your operator. When to visit France : The best times of year are, of course, between April and October: July and August tend to be very busy in most tourist areas. The Spring and the Early Autumn are a great time to visit France, if you are not bound by the requirements of school term dates or work. For day trips to France from the UK compare the options available. It is highly recommended, and in some cases obligatory, to be insured when you travel. Many people have existing policies, or even credit cards, that include travel insurance, but it is always a good idea to check. Make sure that you have accident and emergency cover, including civil third party liability cover (for humans, as well as your car). It is particularly important and usually necessary to take out special insurance if you plan to do anything out-of-the-ordinary while on holiday, such as winter-sports or other types of sport. Copyright notice: Website and text © About-France.com 2003 - 2019 except where otherwise indicated.